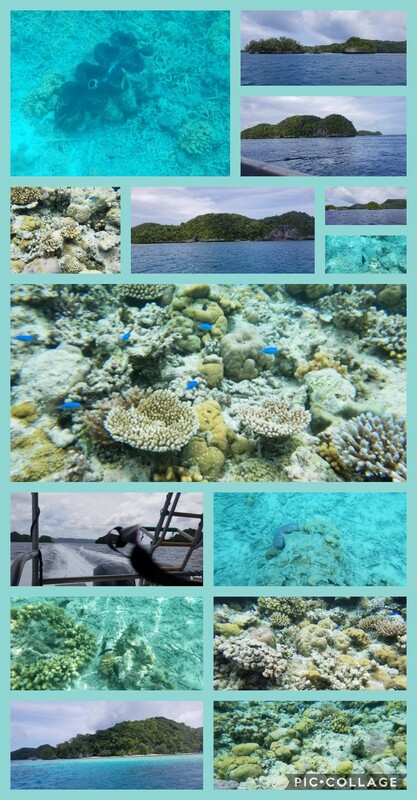 Our second and fabulous day in Palau. Today, only one excursion and happy hour. But what an excursion! Today, it was a little more than half a day snorkel trip! We went to the Milky Way, German Channel, Long Beach, Manta and Karp Island. We departed on a boat with a driver and two guides, one did all the talking, the other smiled a lot. Our favorite question of the day…”You booked a Japanese tour?” Um, what? Oh yeah, when you translate the site, you can book tours for adults and dwarfs! Love that! It was all good, our guide spoke English, luckily, and would speak to us one- on- one and then the group or vice versa. She always started with ‘thank you for waiting’ even when we went first. She was very nice, as was the entire staff. I can honestly say, the entire day, we didn’t see any other non- Asians. We started our trip through the Pacific to the Rock Islands. The Rock Islands of Palau, also called Chelbacheb, are a small collection of limestone or coral uprises, ancient relics of coral reefs that violently surfaced to form Islands in Palau’s Southern Lagoon, between Koror and Peleliu, and are now an incorporated part of Koror State. There are between 250 and 300 islands in the group according to different sources, with an aggregate area of 47 square kilometres (18 sq mi) and a height up to 207 metres (679 ft). They are a World Heritage Site since 2012. PSM was excited, we try to find UNESCO sites on our travels. It was amazing, felt like we saw all of them, even though I know we didn’t. They come in all shapes and sizes, some looked like small round islands, mushrooms almost, others oblong, sea cucumbers, whales, all different. At one point, it reminded me of Pandora, the floating mountains of Avatar, but in the water, ha ha. It was absolutely spectacular! Can’t take pictures of them all, felt like you wanted to! Our first stop was in the Milky Way, this was a lagoon set into the Rock Islands that is so milky blue because of the sediment. It’s this white silky mud that people apply to help the skin, apparently it’s wonderful for the skin, moisturizes, softens and can make you look younger. Reminds me of the mud and sulfer baths in Israel! We swam, cannon balled of the boat while our guides jumped in and dived down to fill up a bucket with the white mud from the bottom. Then… we all slapped it on our faces and bodies and when it was dry…jeronimo! Jump in and wash it off! Do we look younger? Now, favorite exclamation of the day…I happened to put on my snorkel mask first, “Darth Vader!” That was classic and something everyone understood! Geek power! It was amazing and beautiful and wondrous and so much more. I have to apologize, my phone wasn’t great under water, fingers crossed Go-Pro did better! Another amazing trip through the Rock Islands to the German made channel, the water was so blue and clear! And then to a reef with a major drop off, so many beautiful things to see including brightly colored fish wanting to shine and others looking to hide. Coral in so many wonderful colors, shapes and sizes. After that fabulous snorkel, we went back through the channel to Long Beach, this only happens once a month when the tide goes out enough that you can stand, sit, walk, run on the ‘beach’ in the middle of the ocean! So, we walked, jumped, sat in the middle of the ocean! How fabulous is that?! Our other guide took lots of pictures for everyone! Back on our boat to our last stop, Karp Island. This is where they cooked or I should say bar-b-qued lunch. I was lucky, they had a vegan box lunch for me, I still got a bowl of miso soup, a piece of corn and tapioca, this is like a stalk and soft and actually made me think of the pudding! We had time to sit, swim, float, hang out in a hammock while we waited for lunch and after. We chatted with some of the other folks on our boat and on the other boat. The guide from the other boat took a bunch of us, from both boats, on a tour thorough the jungle on the island. Karp Island is also a resort that you can stay at on one of their cabins, we agreed, we would so do that! Who knows what our future holds! After about two hours, it was back on the boat, drop everyone but us and another couple at a hotel on the water and us back to Impac, the dive shop where we started and then a drive back to the hotel. 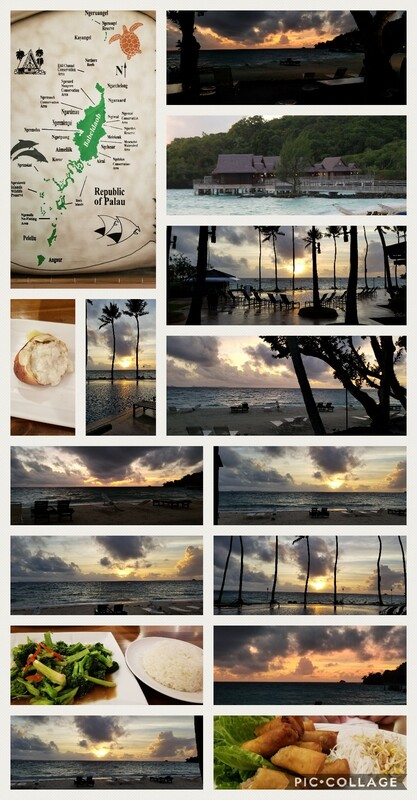 We took showers and headed back out in a taxi to a resort about 20 minutes away for sunset and wow, was it beautiful! Back to the hotel in search of food. Someone mentioned where we could get some clams but we got to the market just as they were closed so to the Pho we go! Pho You Pho Me was the restaurant we chose. A tasty order of broccoli with garlic for me and crab and lumpia for PSM, both quite good, according to him! Back to the room, finish packing, set the alarm and lay down for a nap, our flight is at 145am! That’s how they do things on these islands apparently, our flight on Sunday is 250am. What a day and what an island! We both wish we had more time here in Palau, maybe we’ll come back, love the idea of staying on Karp Island! Are you ready to go with us on our next adventure? !